There has been "no substantial disruption" to European gas supplies due to a dispute between Russia and Ukraine, the European Union says. Several EU countries had reported a drop in supplies after Russia cut off gas to Ukraine on New Year's Day over unpaid bills and a new price contract. And officials in Bulgaria, Greece and EU candidate Croatia, told Reuters supplies were down on Monday morning. EU officials are to meet in Brussels to assess the impact of the stand-off. But ahead of the discussions, EU Commission spokesman Ferran Tarradellas said there was no immediate danger to EU consumers or industry. The cut-off had produced "some irregularities" but "no substantial disruption of supply to any member state", he said. The EU has despatched a team of experts to the Ukrainian capital, Kiev, to put pressure on the two sides to reach an agreement, the BBC's Oana Lungescu reports from Brussels. The mission is also planning to meet representatives of Gazprom in an undisclosed European capital. Pipes across Ukraine carry about one-fifth of the EU's gas needs. Russian gas giant Gazprom accuses Kiev of stealing gas meant for EU customers. Gazprom says it can no longer count on Ukraine as a transit route to EU countries and is seeking alternatives. The Ukrainians say the pipeline network is not working properly after Moscow cut supplies. Among the countries to have reported falling pressure in their pipelines since Russia reduced supplies are Poland, Hungary, Bulgaria, Romania, the Czech Republic and Greece. In some cases supplies had dropped by 30%. The Czech Republic said its levels were back to normal by Monday. Mr Tarradellas said the situation had also returned to normal in Hungary, Poland and Romania. None of the countries were reporting that consumers were suffering supply cuts. 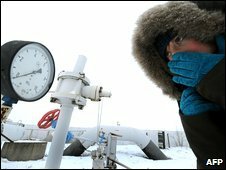 Many EU countries, and Ukraine itself, have built up reserves since a similar dispute between Gazprom and Ukraine at the beginning of 2006 left some countries with shortages for days. The Czech Republic, which holds the rotating EU presidency, is to convene Monday's meeting of envoys in Brussels to discuss the row. The meeting will discuss the impact on gas supplies, but the bloc is divided on how to respond to both Russia and Ukraine. The EU is reluctant to act as a mediator because diplomats say the facts are extremely unclear and the details of various contracts between Ukraine and Russia remain secret, our correspondent says.